19 September 2014, at 8:09p.m. 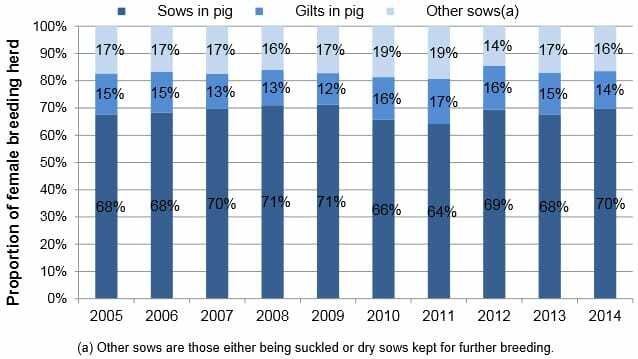 ENGLAND - The annual count on 1 June reveals 2.8 per cent fewer pigs on commercial farms in the country on 1 June 2014 than a year previously, with reductions in all categories. The total number of pigs in England decreased by 2.8 per cent to just under 4.0 million animals in 2014, according to the latest statistics from the Department for the Environment, Food and Rural Affairs (defra). Breeding and fattening pigs both saw decreases in 2014 falling by 5.3 per cent and 2.5 per cent, respectively. The female breeding herd decreased by 4.8 per cent to 329,000 pigs in 2014. The graph shows the make-up of the female breeding herd since 2005. Other breeding pigs also decreased in 2014, falling from 88,000 in 2013 to 82,000 in 2014.